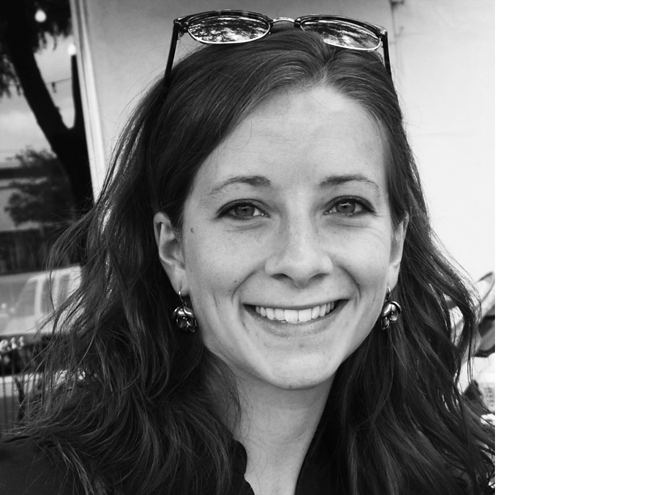 Welcome to our stop on the blog tour! We’re super excited to be a part of this!!! (And winning free stuff is always a fun little incentive for keeping up, right!?!?) So, let’s dive into some questions! The year was 1999. My two good friends (Connie and Vicky) and I decided we would each make a quilt before the new millennium arrived. Connie, being from Iowa, and already knowing how to quilt, became our teacher and mentor. She took this role very seriously! When Vicky and I showed up for our first lesson, Connie presented us with a goody bag stuffed with a quilting frame, thimble, wax, quilt needles, quilting thread, and safety pins. We decided on the Ohio Star design. Every week we had to complete 3 identical Ohio Star blocks made from our own sewing stashes, and then swap out so that we all had the same blocks in all varieties and themes. And since we never do anything in a small way, this first quilt was queen sized. When we finished all of our blocks, Connie sent me and Vicky to the fabric store for sashing and backing fabric. (She had a conflict, but she said she trusted us.) Vicky and I calculated and crunched numbers for over an hour. We checked and rechecked our work before making the purchase. At our next lesson we told Connie that her share was $180.00. Her mouth hit the floor!!! Anyway, we did learn how to layer and hand quilt. I have loved and used that quilt for 14 years now. Memories of the laughter we shared in the process is priceless to me! This quilt became “Rudy’s Window Quilt”… once it was complete, it was never used by anyone but him. Because of it’s size, it folded up nicely into a moldable cushion that I would put on top of our reck-room couch. It was at the perfect vantage point for Rudy to do what he loved most… guarding our house from mailmen, trash collectors, and other potentially dangerous foes. I really really wish I had a picture of Rudy in action… because it was quite a site. 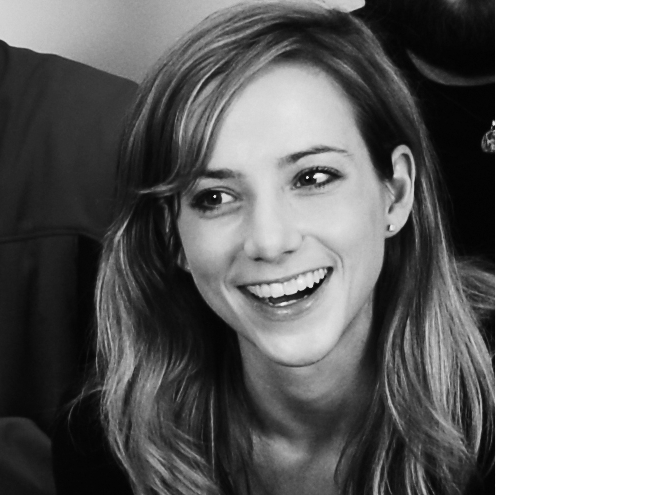 Oh wait wait wait… I found one in a previous blog post! On a depressing side note, we lost our best boy this past year. He’s left a really big hole in our lives, that we’re finding difficult to fill. 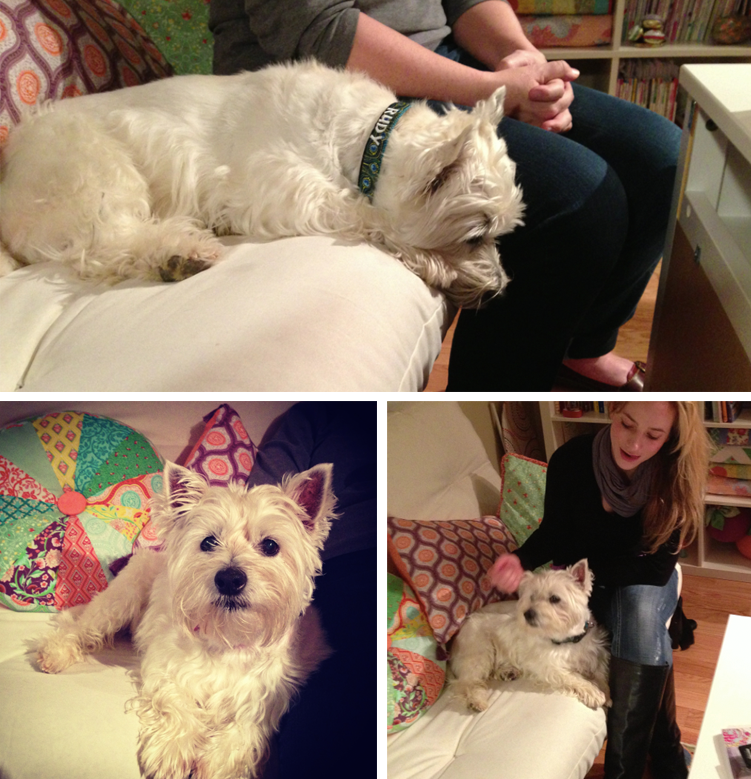 He also made many appearances in our blog over the years, so I’m sure he’ll be missed from here as well. Sketching. I love gridded paper and colored pencils!!! 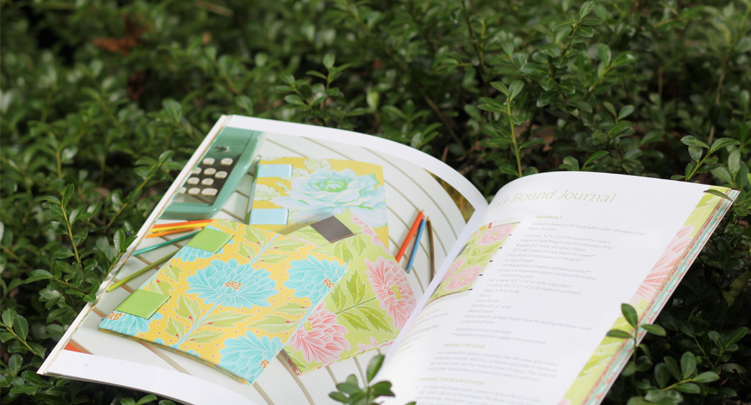 Lauren or Carrie make me a gridded sketch book for each new fabric line that we produce. In it I jot down thoughts, draw fabric ideas, diagram patterns, and write directions. I take it everywhere I go. A fun side note… these sketch books were so popular among my friends, that we decided to include them in our new book! Now for the big project! Here’s another big quilt… this project is featured on all the other blogs, so make sure you check it out. This project really allowed us to get creative! (We missed that “get creative” notation, when the instructions were sent out… and instead, we followed the quilt instructions to a tee.) This project features a layer cake,charm pack or mini charm, but what is your all time favorite moda precut? The directions for this pattern can be found here. I love jelly roles (2 1/2″ strips from selvage to selvage of each fabric in the line). They can be cut into smaller pieces to become parts of quilt blocks. But I like to use them in pattern designs where they remain in their long strip state. 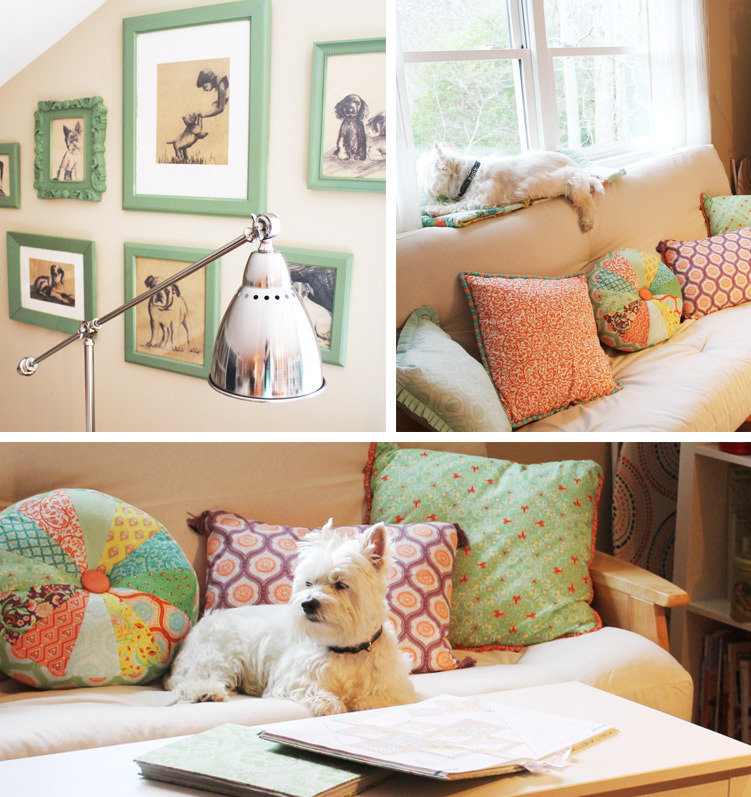 You may be familiar with Angela Yosten’s Princess And The Pea quilt (found on the moda bake shop site). Each jelly roll strip represents a mattress layer. Soooo cute!!! 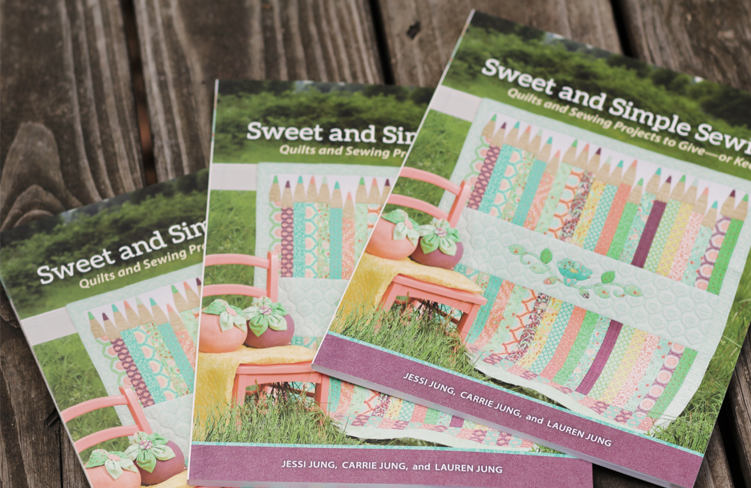 That inspired me to design our Pencil Box quilt pattern, which is featured on the cover of our new book, Sweet and Simple Sewing with Martingale Publishing. And then our latest fabric line, Pedal Pushers, features our Wet Paint pattern which also uses the long jelly roll strips. Here’s how to enter : Just leave one comment… it can be about whatever you want… If you want to tell us about your first quilt, that might be fun! 1. follow us on Twitter. Here’s the link! 2. follow me on Pinterest. Here’s the link! (And then just leave a second column telling us which extra entry you did. We’ll draw the three winners in one week, so be sure to check back! The giveaway features our newest and most favorite line Pedal Pushers! Hope you guys enjoy! … And because I wasn’t super excited with the coloring in that last photo… here’s a better shot of the colors. They’re super nice! Kind of sherberty! Make sure to check out everyone else!! Everyone is awesome! This entry was posted in Pedal Pushers. Bookmark the permalink. Post a comment or leave a trackback: Trackback URL. 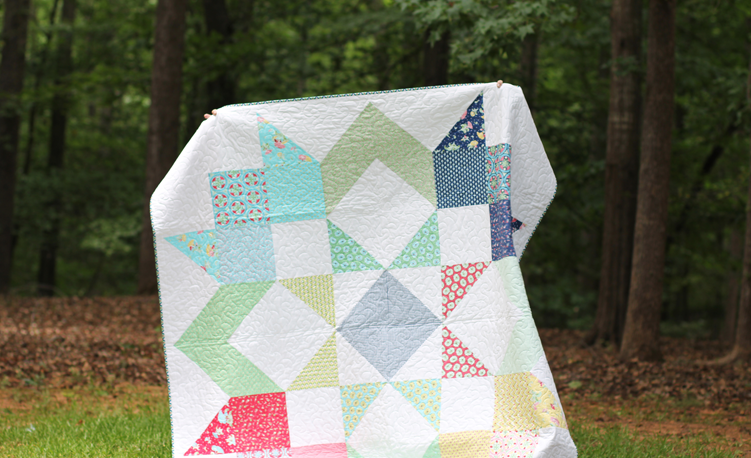 Love your first quilt and the fun story! Love your Moda Love quilt too. I am working on the charm version now. Love your fabrics – the prints & colors are wonderful! My first quilt was an Ohio Star quilt that I pieced and quilted by hand. I love your Pedal Pushers fabric collection. Your book is on my wish list! And I’m following you on Pinterest now! I love your different uses of jelly rolls and your sketchbook covers. I am making a note of your upcoming book for my wish list. Thanks for the chance to win! Love to see your beautiful boy-we lost ours over 5 years ago and still miss him every day! 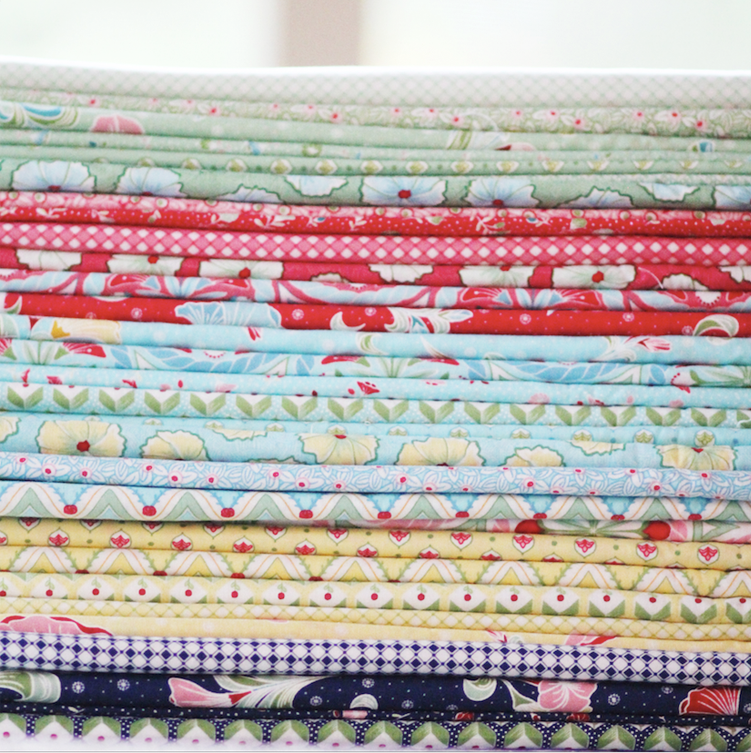 On a brighter note, my favorite precuts are jelly rolls, layer cakes, and, of course, fat quarters. Mt first quilt was made during a beginner quilt class and I made such a mess of it that half-way through, I bought all new fabrics and started over!! I may not have been the most talented, but in was the most persistent!! Thanks for the opportunity! I love the color palette! Thanks for the contest! 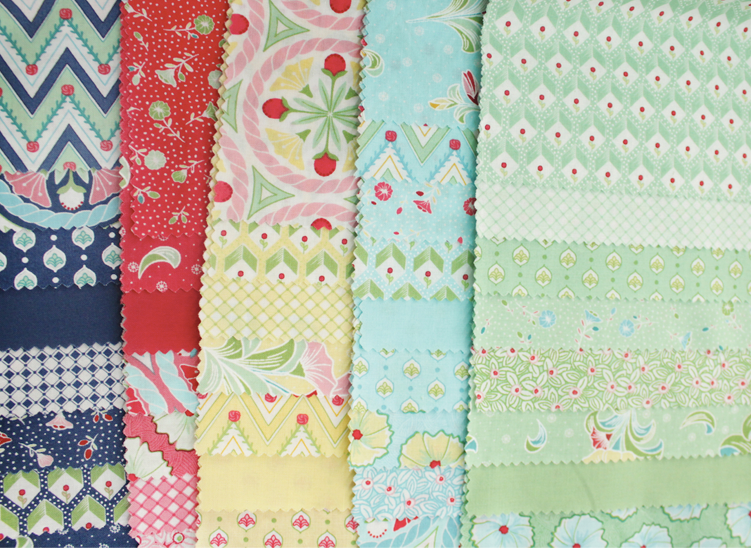 I’m happily following you on Pinterest now – such beautiful quilt boards! Love your Pedal Pushers! I wish they would still call the capris “pedal pushers”. It’s such a cool name that evokes images of us girls pedaling our no-speed bikes around the neighborhood. I now follow you on Pinterest and look forward to looking at all of the lovely things! My first quilt was a few years ago – it was for my son. I enjoyed the experience and have been hooked ever since. Your lines of fabric are among my favorite. I made many block of the months that never got made into a quilts before venturing to think I could get one actually put together. My girl friend’s 60th Birthaday and a layer cake gave me the ‘push’ to make a completed quilt. And, yes, we called them pedal pushers when we were young girls…such a short time ago. When I was pregnant for with my oldest, I decided to learn to quilt and knit. I made her crib set including the quilt. It wasn’t fancy. She still has it today! I love all these fabrics. I just wish I had the time and money to use them all! My first quilt, is not quite finished, I’ve got to pluck up the courage to layer, baste, quilt and bind it as yet! My first quilt was a sampler made in a class that is still waiting to be quilted. I think I need to complete it and donate it to a charity. I really enjoy the colors and ideas you share w/all of us. I’ve just found this blog hop so am trying to catch up. 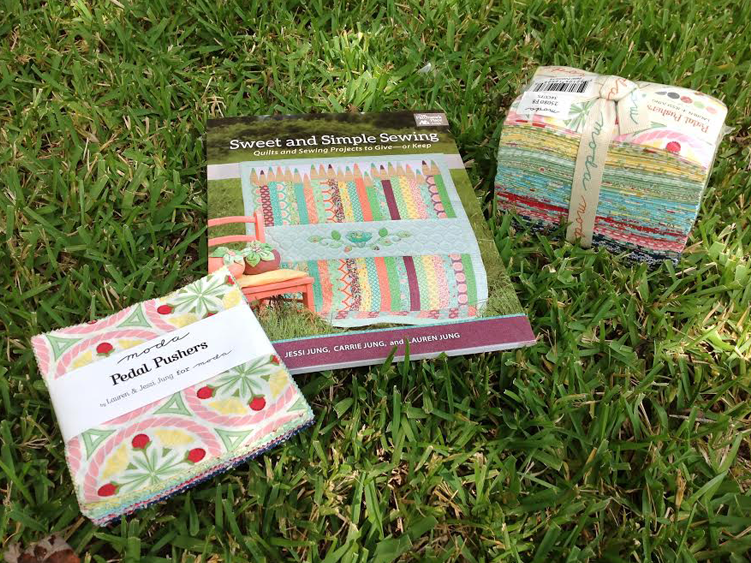 What fun patterns you have used — gives me some new insight into using jelly rolls. Your book is on my “buy” list. OMG I love the colors of your fabric!! You have such great taste in colors and designs. I cant wait to see them at my LQS!! I followed on Twitter (@TillstromLizzie) and on Pinterest (Lizzie Tillstrom) yay!! Hmmm…. my fist patchwork was some kind of Ohio Star pillows, and my first quilt was a linen and cotton one-patch. had to sew over many seams after the first wash, but I love it!